Comments on "Old Man Style...Williamsburg, New York"
This guy looks great. I'd love to meet him. 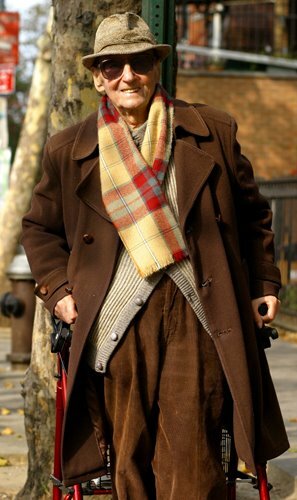 Love the cords, and the scarf and hat, but best of all his smile still looks like he'd love to have a great time. What a great example he makes. This guy is amazing. I would just to talk to him! Looks like he's got things figured out and is squeezing every last bit of life out everything. AND he looks stylish doing it! Bravo. I would give anything in the world to meet this man. he's so full of life-and i'd bet he has some amazing stories to tell. He reminds me so much of my scots-irish Grandpa, those guys know how to wear their wool with class. Amazing person fuller with life than most of my friends actually. I love the lines and the slouchy pants could be horrid but here they add to the great look.